Nintendo UK's Facebook page has announced that this title will be released in Europe in May 2015. 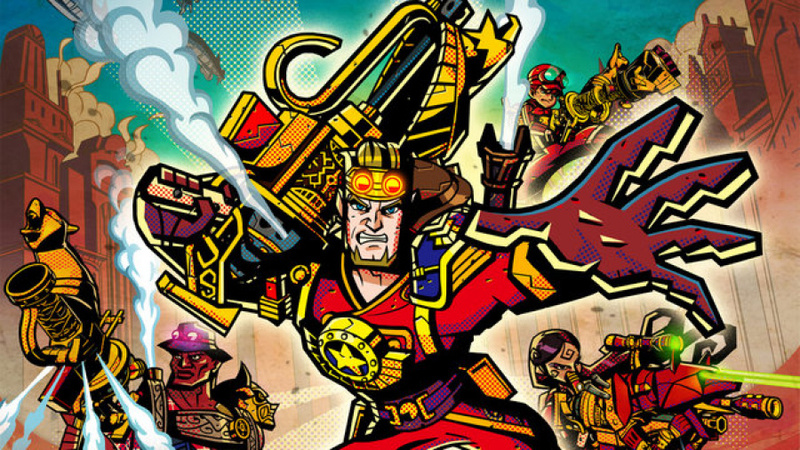 During the inaugural Video Game Awards from Las Vegas, Nintendo of America President Reggie Fils-Aime presented a new trailer for 3DS title Code Name: S.T.E.A.M, which revealed new features and a North American release date. For starters, local and online multiplayer were both confirmed, which naturally suits the turn-based strategy for which Intelligent Systems is so well known. In addition, the trailer ended with a North American release date — 13th March. You can see the trailer below - are you pleased with the announcement of multiplayer and keen to pick this up next March? I will get this because it's from the developers of Fire Emblem: Awakening. That was a fantastic game, and they are a fantastic development team. I've tried Fire Emblem and I just couldn't get into the games. I need to try Awakening, because I hear that's more appealing. And I never played any of the Advance Wars. But this game is looking rather good to me. I do really like the strategy RPG genre, and it's a shame I've barely picked up anything by Intelligent Systems. Codename S.T.E.A.M. just looks so unique, that I'm more than willing to give it a shot. You had my interest, now you have my wallet! Oh yes. Can't wait! I missed the announcement so I still need to see what the multiplayer mode is like, hope it's something I can convince my friends to try out. This was actually the best surprise in the whole show for me. Will eventually pick it up, though MH4U comes out in the same month I think. Man this game looked some what interesting at first but now with multiplayer wich I just loving having the option on my 3DS for some reason I love having anyways this game is very appealing to me now. Can't wait to get more information on the game. @AVahne - I dont think MH4U officially has a date yet but that was my second thought. My first thought was this almost confirms the new 3DS will be out by then, there is so much camera control in that game it will need the nub to play properly. Looks great. Are they working on a Wii U version yet? I kid. I'll wait til I get the new 3DS to play this, right along with MH4U. I think Gamestop lists the limited edition for March, so I'm basing it off that. Either way, this game will have to wait. I have two Neptunia games to worry about in early 2015 and those currently have the highest priority for me. Plus I still need to get Omega Ruby. Wasn't it announced on FEB? oh well better late than never I suppose. But I'll wait a little bit before I get it. I mean I'm a little worried about its story here and the gameplay plays a little like fire emblem so I'm not sure yet. Is it just me, or did it look like there were quickly vanishing spurts of blood whenever you shot someone else in multiplayer? Not that it bothers me, but it looks slightly out of place in a first party game. @Samuel-Flutter - Do it. Fire Emblem Awakening was my first dip into Intelligent System RPG/strategy games and it's fantastic. Even though it's meant to be one of the easiest FE games I still found it tough to get in to with a steep learning curve, but once it bites it doesn't let go and is a blast. Now I've got all the Paper Mario, Advance Wars and FE back catalog to get into, plus Project STEAM. I love the quirky comic-book style look and lore of this game. Not to mention it's developed by IS. Definitely another game on the must-buy list. 2015 is packed already.. I really wish there was a little more hype for this because it looks great! Maaaaan I still have to play FE: Awakening! I might pick that up first, and THEN go for this. Man, Nintendo sure likes to steal the show, that Game Awards kind of felt like a Nintendo Direct and I loved that Koji Kondo was there. This Steam game looks really nice and inventive but I am still questionable about the single-player campaign. This looks REALLY cool, i'm very interested in this. Pleasantly surprised at how soon this game is slated for release! I liked the way this game looked from the start so they practicality already have my money! I seriously need more free time to catch up on my backlog. I feel like im just collecting games at this point. Too much great stuff to play! This and Majora's Mask are going to be Day One buys for me. I will be getting this instead of MH. I would rather support a new IP than another sequel of the only Capcom IP they deem us worthy of getting. That multiplayer gives me a Team Fortress 2 vibe. im down for this, cant wait till it gets here! Well, I loved Fire Emblem Awakening and I love third person games so I can't see how I wouldn't like this. Definitely getting it but might not be a launch day supporter. Might be too busy. Getting this day one!Sad i don't see hype for it,maybe it will be like Bayonetta get critically acclaimed and sell terribly. Sadly, that'll probably be the case. This game looks better than most of the other stuff coming out on handhelds...but it looks like an uphill battle for sales. It was heresy Bayonetta didn't sell better, and it'll pure blasphemy when FFXV (ugh) outsells Xenoblade Chroncles X ten to one. @R_Champ One thing this game has going for it is the pedigree of Intelligent Systems and the success of Fire Emblem Awakening. If Fire Emblem managed to sell over a million copies, and all those people who bought it know how good it is, then hopefully all they need to do is advertise this game based on who the developer is. Say "Hey everyone! This is from the devs who brought you Fire Emblem Awakening!". I'd be hard-pressed not to listen to something like that. Between Monster Hunter 4 Ultimate, Zelda Majora's Mask and Code Name STEAM all slated for the first half of 2015, it's looking to be a repeat of 2013 all over again for the 3DS, if not ever BETTER!